From Alabamas Crimson Tide to New Yorks Jets Joe Namath better known as Broadway Joe wowed football spectators and players alike with his flashy appearance and endearing arrogance. 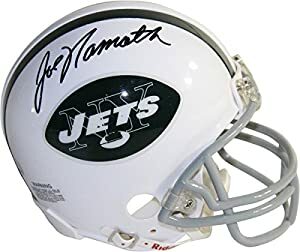 After 11 seasons with the Jets Namath had taken his team to a Super Bowl victory was elected to four AFC All-Star games and named AFL Player of the Year. This Joe Namath autograph is guaranteed authentic and includes a Certificate of Authenticity from Steiner Sports.